"I was standing on top of it [the dam] with forty men, employed in trying to stop the leak, when I felt a motion like an earthquake, and instantly ordered the men to run, the Stones falling from under my feet as I moved off.” [Price p.108]. These are the words of Lieutenant-Colonel John By, describing the third failure of the Hogs Back Dam on April 3, 1829. 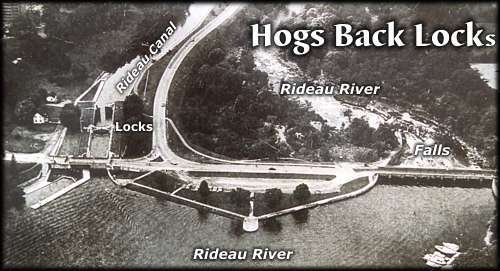 The story of the Hogs Back dam starts with the decision to put the entrance of the Rideau Canal in the location it is today (Ottawa Locks). Colonel By was attempting to avoid the hard bedrock excavation that would have been required if they had followed the route proposed by Samuel Clowes in 1823/24, which had the canal’s entrance at Rideau Falls. Colonel By’s final route (which surveyor John MacTaggart worked to figure out – see the story of Christmas 1826) avoided any significant bedrock excavation. But it did mean that a big dam was needed at Hogs Back, which in the pre-canal era was known as Three Rock Rapids. 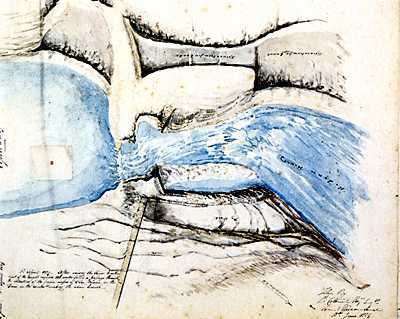 Although the rapids themselves only had a drop of 1.8 metres / 6 feet (there were no falls here in the pre-canal era – see Jebb’s map in the Burritts family story), the dam had to raise much more water since it had to do two things. It had to flood the Rideau River all the way to Black Rapids in order to put a navigation depth of water over the lower sill of the lock at that location. It also had to put water over the upper sill of the locks at Hogs Back, the entrance to the canal cut to the Ottawa Locks. To do this, it had to raise the water of the river in this location by about 41 feet (12.5 m). Hogs Back Lockstation (looking North)This is where the artificial channel of the Rideau Canal in Ottawa departs from the natural channel of the Rideau River. The artifical channel leading to the Ottawa locks can be seen on the left. The dam (now under a road and more modern landscaping) is in the middle and the waste water weir is on the right. The dam, located at the head of the original "Three Rock Rapids" raised the water in this location by about 41 feet. The river continues to flow as it always has, to the Rideau Falls and into the Ottawa River. The top lock at Hogs Back is a "guard lock" - it isn't used for lifting, but rather was put in place as protection, particularly from spring flooding of the main lift lock. Although several were planned, this is the only guard lock built on the Rideau canal. The dam was to be a stone arch dam, similar to the one we can see today at Jones Falls (the dam would be curved with the convex side facing upstream). The contract for the dam and the proposed three locks was awarded to civil engineer Walter Welsh Fenlon of Montezuma, New York (you can see the wording of the contract on the History of Hogs Back page). On May 4, 1827, Colonel By noted that “Mr. Walter Fenlon’s [bid] being much under all others, his tender has been accepted for all the said works [dam and three locks], and he is to complete them in two years from the day of signing the contract.” Philemon Wright and Sons of Hull were awarded the contract to build a cofferdam to allow the stone arch dam to be constructed. Wright partnered with Asha P. Osborne to do this work. The type of dam they were to construct was different than dams built today. A stone dam consists of three main components: the “keywork,” the stones that form the near vertical back (downstream side) of the dam (usually about a 1:10 slope); the “core” of the dam, a watertight section in front of the keywork, generally made using “clay puddle”; and the “apron”, the sloping front of the dam which protects the watertight layer (clay) from erosion. It was an empirical design that worked as long as the watertight layer stayed watertight. Clay puddle (or puddled clay) is clay mixed with coarse sand or fine gravel, wetted and then chopped, beaten and kneaded into a consolidated mass, about two-thirds of its original volume. If kept in an area where it would remain wet (i.e. below the water table) it would stay completely watertight. 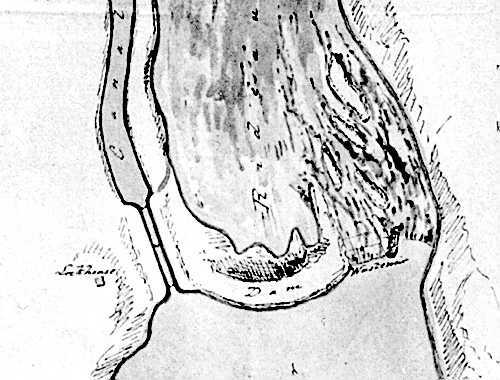 In some areas such as Jones Falls, there was an insufficient quantity of clay suitable for puddling, and “grouted broken stone” (small stones cemented under pressure) was substituted for clay puddle. A problem with building a slackwater canal system (a system where dams transform the flow of a river into still water), is that the dams have to be built across the width of the river. What do you do with the river water while building the dam? At the time of the building of the Rideau Canal, there were essentially three choices. If the dam was small enough, you could build a by-wash (a water bypass) and then just build the dam in the river, letting the river water flow through the by-wash. This was difficult to do with larger dams and higher water flows. These necessitated either building sluiceways in the dam itself (this technique was used for the dam at Jones Falls) or using a cofferdam (a temporary dam upstream from the work area) to divert water around the construction of the dam in the initial phases, and then using the cofferdam to divert the water into the by-wash while you complete the dam. This cofferdam method was used at Hogs Back. Another construction issue at the time was the height of the dam based on its intended use. By’s original thoughts were to follow European convention and construct overflow dams. That is, if you wanted to raise the water 10 feet (3 m), you built a 10 foot high dam and let the water flow over it. The original design for Hogs Back was for an overflow dam, over forty feet in height. After By’s first experience with the Rideau River in spring flood, he realized that the massive amount of floodwater, flowing over a dam, had the potential to erode the bedrock foundation at the base of the keywork, destroying the dam. So he quickly changed his plans, raising the height of many of his dams so that they were no longer overflow dams, and incorporating a waste water channel with a weir (water control mechanism). earth and “rubbish”, and a timber dam, using the design of a mill log dam. This was made by building a sloping crib of large timber. The slope faced upstream, the pressure of the water actually helping to lock the timber in place. It was a simple, yet effective way to built a dam. After completing the preparatory work, Fenlon started to build the stone dam. Work progressed so well that by the fall of 1827, Fenlon thought he was ready to close up his dam. To do this, he excavated a waste water channel (a by-wash) in the east bank, where the water of the Rideau River was to flow once his dam was raised. The bottom of his by-wash was about 27 feet (8 m) above the bed of the Rideau River. Once the river was raised to that height, it would flow through the by-wash. The main portion of his dam had been raised to 37 feet (11 m) and work was progressing well on closing up the area between the completed portion of the dam and the west bank. But in February 1828, a sudden unexpected rise of water washed the west half away, essentially returning it to the state it had been in early fall 1827. Only the east portion of the dam remained. Learning from experience, a slightly modified plan was executed. The concept of turning the water into the by-wash was sound if it could be effectively accomplished. The by-wash was excavated down another four feet and was made forty feet (12 m) wide. The largest timber that could be found, pine and hemlock, fifty to sixty feet long, were used in the timber dam portion of the cofferdam. Even with those lengths, the cofferdam could only be raised two feet above the bottom level of the newly excavated by-wash. The Rideau River proved more than a match for these engineering efforts. On April 1, 1828, spring floodwater topped the cofferdam and eroded out the bank of the river. These floodwaters in turn severely damaged the stone dam. The dam stood about 22 feet (6.7 m) high when Fenlon was released from his contract in November 1828. The Sappers and Miners and a crew of upwards of 300 labourers took over the job of completing the dam. Wright’s crews worked on the cofferdam. With the experience of two dam failures behind them, they widened the by-wash channel to 60 feet (18 m), in order to provide lots of capacity (so they thought) to divert spring floodwaters. According to Colonel By, the dam had been raised 60 feet by late March 1829 (50 feet according to Lt. Denison, one of the other Royal Engineers). A height of 60 feet was 15 feet (4.5 m) above the required height of 45 feet (13.7 m), but Colonel By wanted the dam bigger and stronger. The base (keywork, core, apron) was over 200 feet (61 m) thick. The water had been raised the intended 41 feet (12.5 m), there was now flat water all the way to Black Rapids. By March 28, 1829, the Rideau River was in full flood, with the water rapidly rising in front of the dam. According to Colonel By it was on that day that the dam started to leak and efforts began to try to stem the leakage (Lt. Denison says the leak started on April 2 and efforts to stem the leak started on that day). 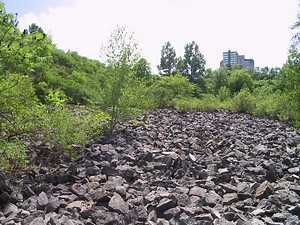 On April 2, large scale slumping occurred in the lower part of the centre section of the dam. On April 3 the dam failed, the floodwaters washing much of it away. The quote from Colonel By at the beginning of this tale describes what happened when the entire dam failed. The failure was due in part to inexperience with cold weather engineering. By the time the Royal Engineers fully took over the project in November 1828, all the earthen material placed on the apron above the existing waterline had frozen in place. It ended up being in essence one large lump of frozen earth sitting on top of unfrozen (below the waterline) earth. In fact it was noted that the ground froze so hard that winter that they had to use gunpowder to blast out earth to use for the apron. The slumping that occurred on April 2 was the unfrozen portion settling down below the frozen earth, allowing water, now under extreme hydraulic pressure, to penetrate to the clay puddle and start washing it away. The dam had sprung a leak. When this was noticed, attempts were immediately made to stem the leak by throwing everything they could find (brush, timber, clay, earth) into the source of the leak. The idea (and this had previously succeeded with a similar leak in the dam at Smiths Falls) was that this material would temporarily stem the flow, allowing an effective repair to be made. They also had men clearing out debris from the by-wash channel, trying to increase this bypass flow of water. But these efforts were far too late. The “earthquake” Colonel By described was the leak fully breaching the keywork of the dam. Now the entire flow of the Rideau River was going through the dam. Lt. Denison says that any plans for a stone dam were abandoned as work progressed on the timber crib dam. Part of the original keywork dam still stood on the east side, but the entire west side of the river was open. To facilitate the transport of the large quantity of stone needed from the quarry, the Royal Engineers had a 1,160 foot (354 m) long “rail road” constructed in the spring of 1829 from the quarry to the dam. The new timber dam construction was a model of simplicity. Timber cribs were laid on the bedrock of the river. As the first course of timber was laid, it was filled with large broken stones to resist the flow of the river. Once this base was secure, they laid courses of timber on top, creating an open timber framework through which the river flowed. The timber crib work was raised to the required height of the dam. 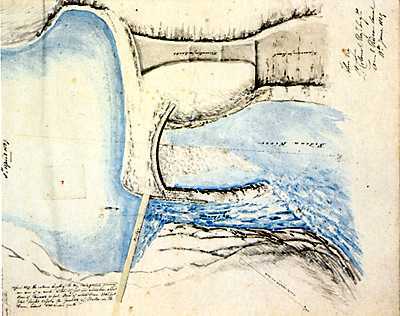 Denison's profile view of the Timber Crib Dam showing the large broken stone piled on the back of it. Illustration from "Rideau Dams", by Lieutenant W. Denison, in "Papers on Subjects Connected with the Duties of the Corps of Royal Engineers", London, vol. 2, 1838. A roadway was built on top of the timber cribs and the cribs were filled with stone, starting from the flanks and working towards the centre. At the same time, earth, stone and rubbish was used to build out an apron in front of the cribs. This apron was huge, extending out almost 300 feet (91 m). Great quantities of large broken stone were piled onto the back (downstream) side of the timber cribs to help stabilize them. The broken stone placed on the back of the dam can still be seen today. By November 30, 1829, the dam had been completed to the point where water was running through the by-wash. Although some minor slumping was noted, there was no failure of the huge mass of earth, timber and stone. It wasn’t as elegant as a stone arch dam, but it worked. When the new dam and weir survived the spring floods of 1830 we can be sure that Colonel By and his men all let out a great sigh of relief. 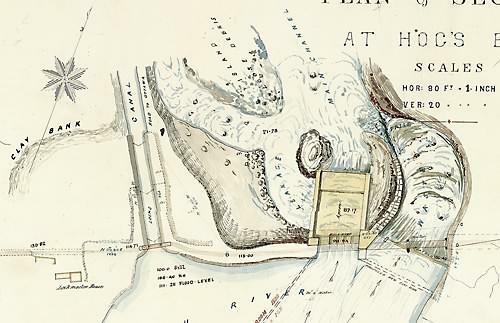 Hogs Back 1832 (looking north)This map shows the final configuiration of Hogs Back, from left; the two locks (one lift lock, one guard lock) leading into the channel to Hartwells and then Ottawa; the timber/earthen dam; the wooden waste water weir; and the waste water overflow channel. Illustration by Edward C. Frome in "Account of the Causes which led to the Construction of the Rideau Canal, connecting the Waters of Lake Ontario and the Ottawa; the Nature of the Communication prior to 1827; and a Description of the Works by means of which it is converted into a Steam-boat Navigation", by Lieutenant Edward C. Frome, in "Papers on Subjects Connected with the Duties of the Corps of Royal Engineers", London, vol. 1, 1837. Hogs Back - mid-1800s (looking north)This undated map, likely from the mid-1800s (or perhaps after the reconstruction of the weir in 1862), shows the configuration described in Frome's map (above). The site had continued problems with spring floods, the dam had to be repaired and the weir had to be reconstructed several times. Today a single, very large cement weir, controls the water flow. "Rideau Canal, Plan and sections at Hog's Back" by unk., n.d., Libary and Archives Canada, NMC 31191. "Rideau Dams", by Lieutenant W. Denison, in "Papers on Subjects Connected with the Duties of the Corps of Royal Engineers", London, vol. 2, 1838, pp. 114-121. "Account of the Causes which led to the Construction of the Rideau Canal, connecting the Waters of Lake Ontario and the Ottawa; the Nature of the Communication prior to 1827; and a Description of the Works by means of which it is converted into a Steam-boat Navigation", by Lieutenant Edward C. Frome, in "Papers on Subjects Connected with the Duties of the Corps of Royal Engineers", London, vol. 1, 1837, pp. 73-102. "Construction History of the Rideau Canal," by Karen Price, Manuscript Report 193, Parks Canada, Ottawa, 1976.